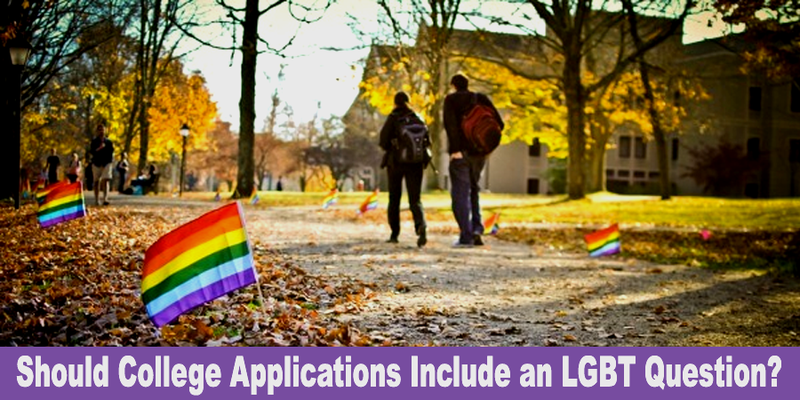 Should College Applications Include an LGBT Question? College applications serve many purposes. While they certainly exist to help a college determine who is most academically eligible to enter the school, they also help the school to make sure that they have a diverse student body. While questions about race and disability status are fairly common on applications in the United States, there’s other factors that are never really discussed – sexual orientation and gender identity. While those on the LGBT spectrum might find themselves dealing with discrimination in daily life, they’re rarely afforded the chance to identify themselves for demographic purposes in the way that someone in a racial minority might be able to do. As such, it’s important to consider the question of whether colleges should include an LGBT question on their applications. It’s important to start any discussion about including an LGBT question with defining the question itself. After all, there are dozens of potential questions out there – and only a few actually make sense. There’s a certain amount of difficulty in figuring out exactly where one would even put a question about a student’s sexuality and/or gender identity, and failure to handle things with the utmost sensitivity would definitely lead to more problems than it could every solve. So, it must be asked – what would the purpose of that question even be? Obviously, the question needs to be posited in such a way that it’s inclusive – if it’s not, after all, what’s the point? Beyond that, the question needs to serve an actual purpose. If the school is asking the question so it can better serve students’ needs, then it’s going to be useful. Even just gathering demographic data can be helpful in some areas. If the question isn’t posed right, it simply ends with the school collecting a bit of personal information that won’t serve much of a purpose. So, an inclusive question can help in some situations. Assuming a perfectly constructed question, there are definitely arguments that could be made in favor of including an LGBT question on a college application. By identifying students on the LGBT spectrum, a school can better serve the needs of an often invisible part of its population. That might mean putting more money into clubs and activities that serve the LGBT students, or even simply working harder to make sure that the campus is more inclusive at a basic level. The question could open doors for students that might not otherwise be available, even at a college with great intentions. Questions about the LGBT population could also end up making campuses safer for some students. By boosting the awareness of the school’s LGBT population, the school could put programs in place to help students deal with everything from cyber-bullying to the difficulties that are often inherent in coming out. The simple act of identification could play a huge role in the lives of students, and all it might take would be a few more lines of text on an application. This might be a best-case scenario, but it’s also a scenario that should not be discounted. Of course, identification carries with it its own difficulties. The mere act of asking a question about one’s orientation or gender identity is fraught with its own problems. First and foremost is the fact that some students simply aren’t comfortable disclosing their orientation or identity on a document that others – including their parents – might read. Embracing one’s identity is a difficult enough process without having it stamped on an official document, and some students might be forced deeper into the closet if they are confronted by something so bluntly stated. Instead of encouraging LGBT students, adding a question to the application might harm them. There’s also the sad but still present possibility of discrimination based on the answer to the question. To say that LGBT issues are divisive would be something of an understatement, and there’s no guarantee that a college would use the information fairly. Indeed, all it would take was one admissions officer who didn’t believe in LGBT lifestyles to cause major problems for potential students. In some ways, the addition of the question could be far more harmful than leaving it off the application entirely – and the harms caused might outweigh any potential benefits for students. So, should a question about LGBT issues be included on a college application? There’s not a really clear answer. There are certainly benefits to having the question included, but the related harms are just as important. The only clear answer is that any potential question would have to be exceptionally well crafted – and optional. Giving the students a chance to reveal information about themselves may be an important step forward in the way the world deals with the issue of LGBT representation, but respecting the rights of a students to his or her own privacy seems as if it might be equally as important.